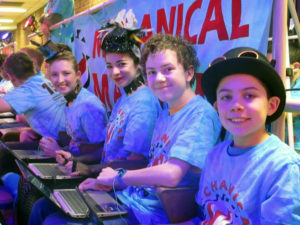 On March 8-10 at Worcester Polytechnic Institute’s Harrington Auditorium, Mechanical MAYHEM enthusiastically competed for the first time with our 2017 robot: Blaise’n 40. On the first day of competition, Blaise’n 40 stole the show while maintaining an undefeated winning streak of 8-0. Routinely winning with 250 points on the board, Blaise’n 40 earned the second-seed position at the end of the qualification matches on Friday. 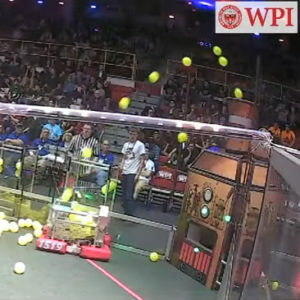 A playlist of all of our WPI matches is available on our YouTube channel. Due to the hard work of our diligent scouts, MAYHEM picked two incredible robots during alliance selection: Teams 190 (Gompei and the H.E.R.D. from Worcester, MA) and 1740 (Ledyard Cyber Colonials from Ledyard, CT). Each of these three robots complemented the abilities of the others, resulting in an extremely effective alliance. 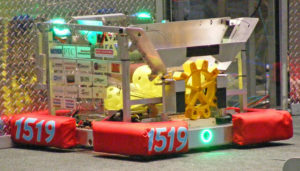 Despite a setback in the first elimination match, this alliance breezed through both the quarterfinals and semifinals, earning a position in the finals. 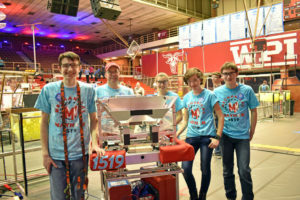 After three hard-fought matches, MAYHEM, 190 and 1740 applauded the first-seeded alliance as the district event winner (Congratulations to 3623, TerrorBots; 2370, IBOTS; and 1991, the Dragons)! MAYHEM was honored to receive the Excellence in Engineering Award sponsored by Delphi! The judges said this about our robot, “Short and sweet, this team’s robot scored! They flat-out excelled in ALL phases of the competition. Additionally, they were impressive with their ability to articulate the conception, design, engineering and construction of their spectacular control system, including a smart dashboard, a dual-cam agitator, and their ‘H-Module’ which provided for better driving control.” It’s affirming to receive such positive feedback from the judges after all of the long hours and late nights Blaise’n 40 spent under development. 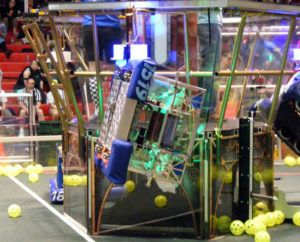 Furthermore, MAYHEM would like to congratulate our friends from Team 4905 Andromeda One on their Chairman’s Award win. MAYHEM will compete at the Pine Tree District Event on March 30 – April 1, in Lewiston, ME. Follow our performance on the Blue Alliance. Would you consider supporting our team as we ramp up our efforts? Please visit our sponsor page or sign up for our newsletter to learn more. Your generosity is sincerely appreciated. 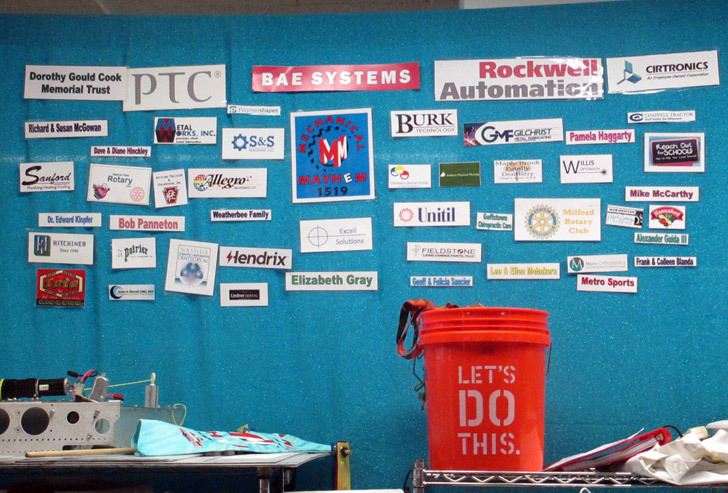 Sponsor logos displayed above our pit at the WPI District.